ACH Foods Manufacture recently changed this product name from Frenchs Original Chili-O Seasoning Mix to their Durkee brand and its name to: Durkee Chili Pronto. The exact same great tasting product just with a new name. 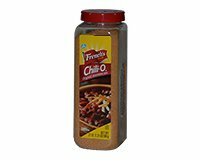 Use French's Chili-O for quick chili preparation. It's ready in 25 minutes! Tastes Great Too! This foodservice package contains enough Chili-O Seasoning Blend to season 10 lbs of meat. Ingredients: Wheat Flour, Chili Pepper and other spices, Salt, Maltodextrin, Sugar, Paprika (as color), Onion Powder, Red Pepper, Garlic Powder, and less than 2% Silicon Dioxide added to prevent caking. Allergy Information: Contains Wheat. Stir in French's Chili-O Seasoning. Add tomatoes, and kidney beans. Mix well.